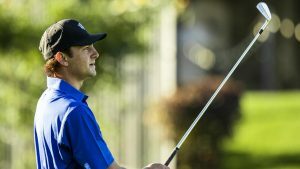 SAN BRUNO, Calif. – BYU men’s golfer Peter Kuest was named West Coast Conference Golfer of the Month for the second consecutive month Tuesday, sharing the honors for October with Pepperdine’s Clay Feagler. Kuest took first at the Visit Stockton Pacific Invite Oct. 25-27, tying the lowest three-round score in BYU golf history with a 197 (-16), including a career-low 64 in the third and final round. Prior to that, Kuest took third at the Jerry Pate National Intercollegiate Oct. 8-9, with a 204 (-6), and 32nd at the Nick Watney Invitational Oct. 1-2. For the month, Kuest competed in three events and nine rounds, totaling 619 strokes (-20), with a 68.77 average. Below is Kuest’s round-by-round scoring from the three October tournaments.